Hyperchromasia of the red blood cells (RBC), defined as an elevation of the hyperchromic subpopulation, has been described for various medical conditions. However, neither the association of hyperchromasia with an altered RBC membrane nor with other medical conditions has been investigated in a systematic way so far. Since the percentage of hyperchromic RBC is measured on a routine basis by many hematologic laboratories, we evaluated the predictive value of this parameter for the detection of RBC disorders. 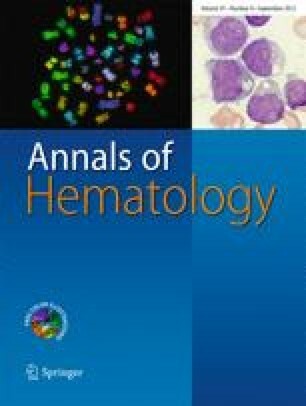 An extensive workup of all patients undergoing standard hematogram during a period of 6 months at our institution with a fraction of hyperchromic RBC larger than 10 % was collected by reviewing the medical history and performing osmotic gradient ektacytometry on RBC from a part of these patients. Thirty-two thousand two hundred twenty-six individuals were screened; of which, 162 (0.5 %) showed more than 10 % hyperchromic RBC. All of the patients examined by ektacytometry featured abnormal membrane deformability. Hereditary spherocytosis was found in 19 out of these 32 patients, in most cases unknown to the patient and currently asymptomatic. Another 17.9 % of the patients with an elevated subpopulation of hyperchromic RBC suffered from viral infection (human immunodeficiency virus, hepatitis). Our study shows that an elevated proportion of hyperchromic erythrocytes larger than 10 % is associated with both hereditary and acquired RBC membrane disorders and further follow-up should be considered. The ethical committee of the University Hospital of Zurich granted ethical approval for this study, which, therefore, has been conducted in accordance with the 1964 Declaration of Helsinki. All authors had access and full control of all primary data. If requested, the journal will be granted access to the primary data.